Welcome to the Historic Best Western Corpus Christi! 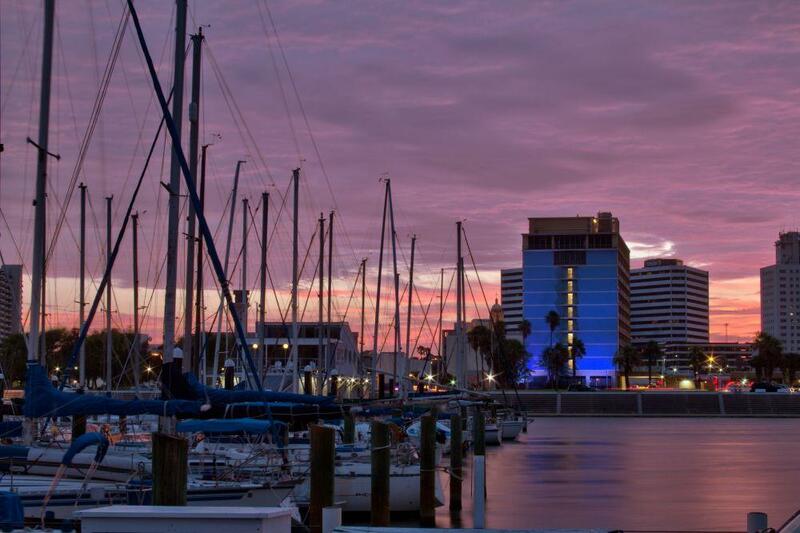 All rooms have a view of the bay and marina at our Corpus Christi hotel, a favorite getaway for couples, families and those passing through the Lone Star State. If you want a hotel near the bay in Corpus Christi, our property combines a superior location with affordable rates and genuine southern hospitality. We are within walking distance to shopping, restaurants and nightlife, so you don't need to worry about parking or navigating new streets. Your Best Western Corpus Christi is designed and managed with convenience and comfort in mind. There are not many pet-friendly hotels in Corpus Christi, but we know that your four-legged friend is part of the family and everyone is welcome. Within driving distance to golf and beaches, there is no shortage of fun activities nearby. We are located in the heart of downtown, so going on walks is simple and the cool, spacious rooms are more than large enough for all. When you are looking for hotels in Corpus Christi that can accommodate the whole family, depend on us to be your home away from home. The Selena Memorial, American Bank Center and USS Lexington are all just a quick walk from our Corpus Christi hotel. Visit the WWI sites or the aquarium for a family-friendly trip with a dose of culture. Free Wi-Fi, a free hot breakfast, and a top floor lounge with amazing views will be waiting when you return. All rooms have views of the marina, and there is always plenty of free parking. That hot breakfast with waffles, 100% Arabica coffee and other favorites is especially enjoyed by business travelers. Employees of Citgo , Shell Corporation, Flint Hills and Valero are just a few of the regular guests at our Corpus Christi hotel. Whether it is business or pleasure that brings you to town, you deserve to be treated to luxury bedding and top amenities. Our hotel is currently under construction, which may cause loud noises during the hours of 9am-5pm. GrandView Lounge: GrandView Lounge, on premises, Bar/Lounge, American, Open for: dinner, Enjoy our daily drink specials and happy hour while looking over Corpus Christi's beautiful marina through our breath taking panoramic view. U & I Restaurant: 0.20 mile(s) from U & I Restaurant, Bar/Lounge, American, Open for: lunch, dinner, long-standing family run venture offering seafood snd steaks grilled over mesquite,plus a full bar. Howards BBQ: 0.60 mile(s) from Howards BBQ, Bar/Lounge, American, Open for: lunch, family owned and operated. Family friendly environment with quality BBQ, unlimited 20ft hot and cold salad bar. Dos Comales: 0.10 mile(s) from Dos Comales, Bar/Lounge, Tex-Mex, Open for: lunch, dinner, bi-level eatery and bar in a contemporary colorful space with outdoor seating. Surf City Squeeze: Surf City Squeeze, on premises, Fast Food, American, Open for: breakfast, lunch, dinner, Opened 7 days a week offering smoothies, slushes, fresh lemonade. Water Street Seafood Comp: Across the street from Water Street Seafood Comp, Bar/Lounge, American, Open for: lunch, dinner, locally owned. Long standing restaurant serving oysters,sushi rolls Gulf seafood and much more. Whataburger: Across the street from Whataburger, Bar/Lounge, American, Open for: breakfast, lunch, dinner, the two storied Whataburger is located right next door to our hotel. Subway : 0.10 mile(s) from Subway , Bar/Lounge, American, Open for: lunch, dinner, attached to Super 8. Casual counter-serve chain for build-your-own sandwiches and salads with with health-conscious options. Executive Surf Club: Across the street from Executive Surf Club, Bar/Lounge, American, Open for: lunch, dinner, locally owned. Upbeat restuarant featuring burgers, seafood & craft beers on tap, plus an outdoor patio with live music. AKA Sushi: 0.10 mile(s) from AKA Sushi, Bar/Lounge, Japanese, Open for: lunch, dinner, easygoing choice for Japanese fare, including classic and creative sushi rolls. Landry's Seafood House: 0.20 mile(s) from Landry's Seafood House, Bar/Lounge, American, Open for: lunch, dinner, family friendly chain eatery offing steaks and Gulf Coast seafood in laid back surroundings. Blimpie American Subs: Blimpie American Subs, on premises, Deli, American, Open for: breakfast, lunch, dinner, Opened 7 days a week offering sub sandwiches, salads, pizzas, fresh and made to order. Kahala Coffee Traders: Kahala Coffee Traders, on premises, Coffee Shop, American, Open for: breakfast, lunch, dinner, Opened 7 days a week offering frappes, lattes, fresh brewed coffee drinks hot and cold. From: Interstate 37. Take the Shoreline exit. Take a right on Shoreline and go seven blocks. The Best Western Corpus Christi is on the corner of Shoreline, Lawrence and Williams Streets. From: Highway 181. Take the Shoreline exit. Take a right on Shoreline and go seven blocks. The Best Western Corpus Christi is on the corner of Shoreline, Lawrence and Williams Streets. From: the Airport Turn right out of the Airport onto Hwy 44, Exit South Padre Island Drive West (358) to Interstate 37 South. Take I-37 S to Bayfront/Shoreline Blvd. Exit, Go to Shoreline Drive and turn right, we are seven blocks ahead on your right. U.S.S. Lexington,3.00 mile(s) from U.S.S. Lexington, Travel back in time aboard the famous U.S.S. Lexington. Featuring a flight simulator and on-board movies at the 3D Mega Theater, your visit to this World War II naval aircraft carrier will be anything but ordinary. Botonical Gardens,15 mile(s) from Botonical Gardens, For a delightful fusion of beauty, nature and art visit the South Texas Botanical Gardens & Nature Center. Experience a variety of attractive garden creations such as roses, tropical flowers and 2,500 different orchids.